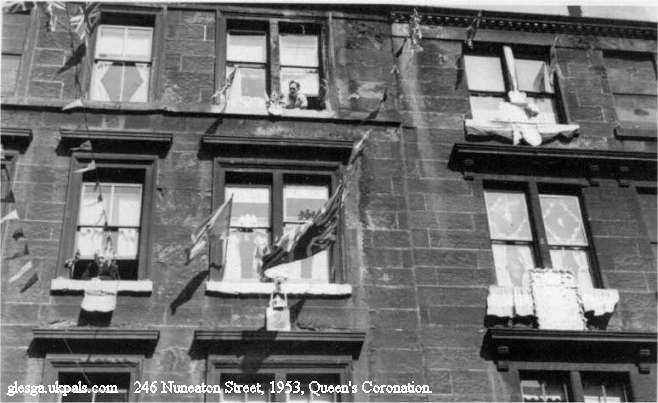 brought back so many memories of life in the tenements. Great job Webmaister." Photograph of John Aird, 1953 hingin' oot the windae of his 3rd storey hoose. "......the picture of my Dad looking out the window has come out really well, it is 38 years since he died. I can tell you it was so moving seeing him on the website like that. I can remember that day he had that picture taken and I remember many a time we would lean out that same window looking up at the night sky and talking to each other and him telling me he loved me all the way up to the sky and back down again...... I have kept this up with my daughter and grandaughter and always told them I loved them all the way up to the sky and back down again." 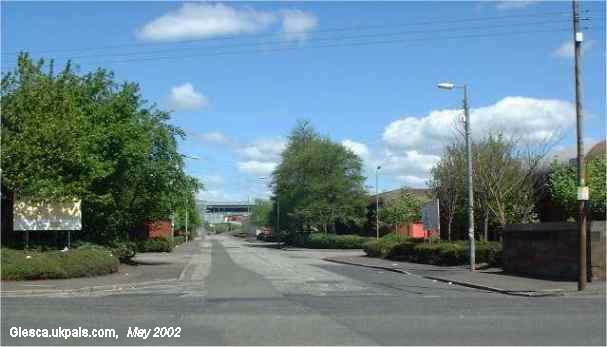 Shops / houses in Dalmarnock Road between Dunn St and Nuneaton St.
Nuneaton Street, photo taken from Dalmarnock Road. All the tenements, the Plaza picture hall, the shops have been replaced by trees and industrial units. Difficult to make out, but the grey building at the very end of the street is Celtic Park football stadium. "..I was looking through the memory lane and wondered if anyone remembers the PENNY GANDY? Theguy used to come round the streets with his horse and buggy and for a penny you could go round the block. My trip was down Mordaunt Street to Baltic Street, up Nuneaton Street then back to where you started. All of five minutes for a penny, was this magic or what......"
"I remember staying in Nuneaton St, when I was about 9 or 10 I fell on the spikes that were roon the back. (that wis sore) shortly after that they cut all the spikes off the top of the railings. Nuneaton St was a very busy street, My uncle Charlie had the cobblers shop there, we had a picture hall (The Plaza) a pub on every corner (almost) a cafe, butchers bakers and naw nae candlestick makers. 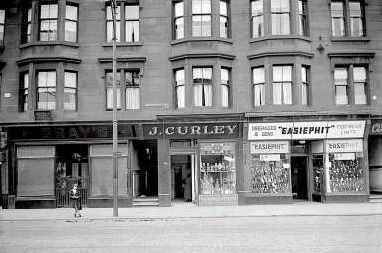 my Ma still lives in Brigton (Ruby St Flats). I Am 51 now and I remember the lucky middens like it was yesterday. (maybe it was)....."